Skolkovo International Gymnasium has successfully completed the International Baccalaureate authorization process for its Middle Years Programme (MYP) for pupils aged 11-16. The Skolkovo Gymnasium already has IB authorization for its Diploma Programme for 16-19-year-olds. The school received a letter from IB on Monday informing it that its MYP application had been sucessful, and it will receive official IB status for its second programme once the authorization process is complete. 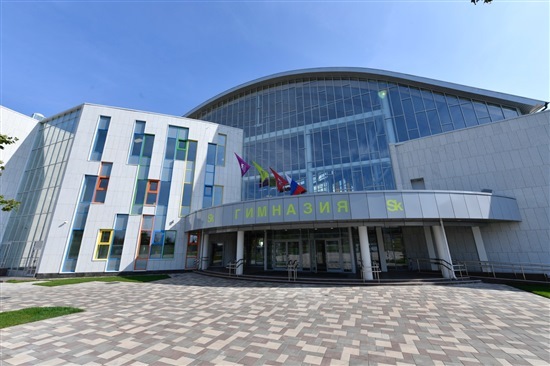 The Skolkovo International Gymnasium moved into its new home at the start of this school year. Photo: Sk.ru. “De facto, we are already working in accordance with IB standards,” Skolkovo Gymnasium head Oskana Demianenko told Sk.ru back in August, shortly before the start of the new school year. “In receiving authorization, we will get additional opportunities available to the IB school community, and most importantly, confirmation that the quality of teaching meets international standards,” she said. In the next academic year, pupils studying the IB Diploma Programme will study maths, a foreign language and literature, physics, biology, economics and world history, as well as their native language. The range of subjects on offer will increase every year, starting with the addition of environmental systems, business and management, and chemistry. IB diplomas are accepted by about 2,000 universities around the world, including Oxford and Cambridge, Harvard, Princeton, Imperial College London and the National University of Singapore. In Russia, the IB is recognized by Moscow State University and the Plekhanov Russian University of Economics. The Skolkovo International Gymnasium moved into its brand new purpose-built home at the beginning of this school year. The private school, which is open to pupils aged 2-18 from outside the Skolkovo ecosystem, as well as to the children of those who work at Skolkovo resident startups, the Skolkovo Foundation itself, partner companies and the Skolkovo Institute of Science and Technology, currently has about 335 pupils. As befits a school located inside an innovation city, there is a focus on natural sciences and technology – pupils are taught robotics from first grade – as well as foreign languages: English (taught by native speakers), Chinese, German and Spanish.